Switching on the display automatically. Select reverse gear with the ignition switched on or the engine running. Switching the display off manually. Press a function selection button on the radio or navigation system ⇒ BookletRadio, or ⇒ BookletNavigation system, . OR: touch the function button on the screen. 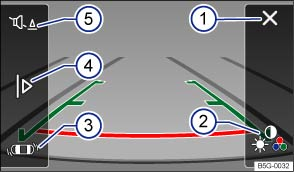 OR: after switching off the ignition, the reverse assist system picture is switched off after a few seconds. Switching off the display by deselecting reverse gear. The picture is switched off after approximately 8 seconds. The system immediately switches to the optical display. Switching off the display by driving forwards. Drive forwards faster than approximately 10 km/h (6 mph). Drive forwards faster than approximately 10 km/h (6 mph). Switch off the reversing camera image. Set display: brightness, contrast, colour (in vehicles with a navigation device). Switch to the ParkPilot optical display . To change back to the camera display, shift into reverse gear. Show or hide the mini ParkPilot display. If the reversing camera is not providing a clear image, e.g. if visibility is poor because the lens is dirty. If the space behind the vehicle cannot be seen clearly or completely. If the rear of the vehicle is heavily loaded. If the driver is not familiar with the system. If the position or angle of the camera has changed, e.g. following a rear-end collision. The system should be checked by a qualified workshop. 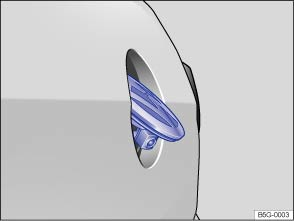 The reverse assist system camera only supplies two-dimensional images. Due to the lack of depth of field on the screen, potholes and dips in the ground, protruding parts on another vehicle or protruding objects on the ground may be difficult or impossible to see on the image. Objects or other vehicles may appear closer or further away on the screen than they actually are. If you drive from a level surface onto an upward or downward slope. If you drive from an upward or downward slope onto a level surface. When approaching protruding objects. Such objects can leave the camera's field of vision while you are reversing. Switch on the electronic parking brake. Moisten the lens with a commercially available alcohol-based glass cleaner and clean the lens with a dry cloth . Remove snow with a brush. Remove ice with a de-icer spray . Never use an abrasive cleaning product to clean the lens. Never use warm or hot water to remove snow and ice from the lens of the camera. This could damage the lens. It is not possible to open the tailgate if the Volkswagen badge is folded out. Volkswagen recommends that you practise parking with the reverse assist system in a traffic-calmed area or car park with good vision and weather conditions, so you can familiarise yourself with the system and the orientation lines in a safer environment. The reverse assist system cannot be switched on if the tailgate is open.